The poplar cuttings collected last Spring have now made it into the ground. One day I hope they will form a beautiful southern boundary to the vineyard. I confess they are purely aesthetic and not planted as a windbreak as the prevailing winds are from the NW. 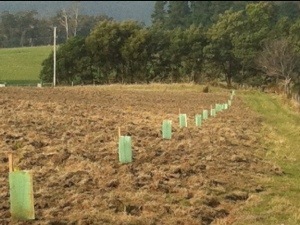 However, planted on the opposite side of the property, they would have cast shade over the vines when fully grown. This entry was posted in vineyard. Bookmark the permalink.